Every year, hundreds of children and teens play on an organized football team. The Montreal Children’s Hospital Trauma Centre sees over 350 football related injuries per year. 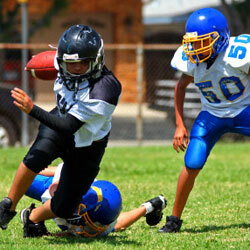 Common injuries sustained in football are broken bones , sprains and concussions. Consider these important tips to play smart and safe! All equipment should be Canadian Standards Association (CSA) certified. Wear appropriate and well fitting protective gear at practices and games. This includes: helmet with facemask, mouth guard, chin strap, shoulder pads, hip and tailbone pads, thigh pads and knee pads. Wear properly fitting running shoes/cleats appropriate for the playing surface. A properly fitted mouth guard protects your gums and teeth. Keep your equipment in good shape. Replace a cracked helmet or facemask. Make sure the playing fields are regularly maintained and that they are free of hazardous objects. Coaches should check the field before practices and games. Keep first aid equipment nearby at all times. For more information about emergency preparedness visit the St. John Ambulance web page. Remember, equipment does not make you invincible. Work to maintain proper fitness. Warm-up and stretch before a practice or a game. Cool down after a practice or a game. Practice your skills and use proper techniques. This helps you be a quicker and better player. Listen to your coach’s safety recommendations to avoid being injured and to avoid causing an injury to another player. Keep your head up. Stay alert. Stay sharp. Stay focused. Everyone’s role is key in encouraging sportsmanship and ensuring that a fun and positive experience is had by all. Demonstrate a positive attitude and work together as a team. Know and respect the rules at all times. Respect the sport, yourself, teammates, opponents and officials. Encourage and promote team work. Set a positive example. There should be zero tolerance towards intentional violence. Coaches should be certified and officials should be qualified to teach players about dangerous situations. Rules must always be enforced. Pay attention to early signs of injury. Never play through an injury. Seek medical attention immediately when an injury is suspected. Respect the recommendations and activity restrictions prescribed to ensure a full recovery. Return to football only once fully recovered. Your return to play should be gradual to ensure you are physically and mentally ready to play and to avoid re-injury. If your child or teen has sustained a concussion, go to the MCH Concussion page for more information.